Every unwanted promotion/newsletter/coupon that shows up in your inbox is a reminder that you should really get your unread messages under control. But after ending up on dozens of useless mailing lists over the years, it can be hard to know where to start. The creators of Astro understand you’re overwhelmed, and they’ve programmed an algorithm to help. As Fast Company reports, the new app uses artificial intelligence to anticipate how you’ll respond to the messages flooding your email. If there’s someone you correspond with regularly, for example, Astro will notice and automatically prioritize their emails. 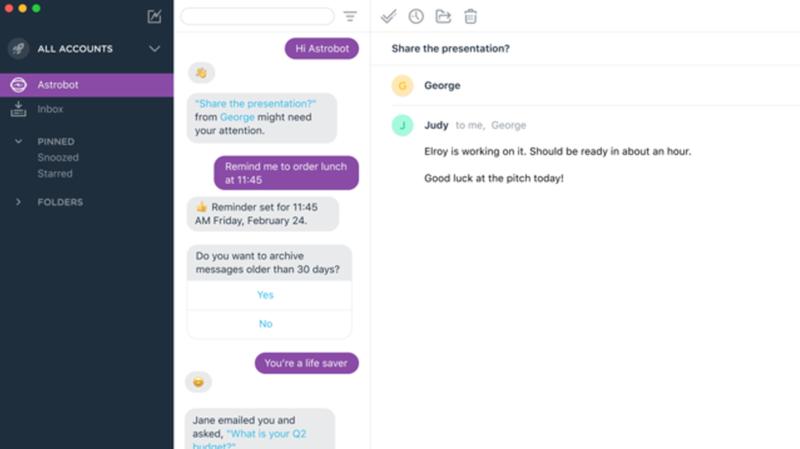 If you suddenly stop responding to an email chain, Astro will send you a reminder in a chat bot window, highlighting any questions that went unanswered. The chat feature works both ways. If you want to unsubscribe from an email list, or learn more about an address you don’t recognize, you can ask Astro for help by sending it a message. Sometimes sending directions isn’t necessary: After analyzing your behavior, Astro will prompt you to delete messages, unsubscribe from emails, and archive chains that are likely irrelevant. Astro offers the same features as most email organization apps—folders, scheduling, notifications, mute, and snooze buttons—but it’s the AI component that sets it apart. After rolling out in beta for Mac and iOS, the app debuted on Android on Tuesday, April 25. Compatibility with Amazon's Alexa assistant is also in the works. Holders of a Gmail or Office 365 account can sign up to try out the beta app today. If you’re still not mentally prepared to clear out your inbox, even with an AI helper, there are a few shortcuts you can take to reach Inbox Zero. Here’s a step-by-step guide to marking all your messages as read in Gmail.